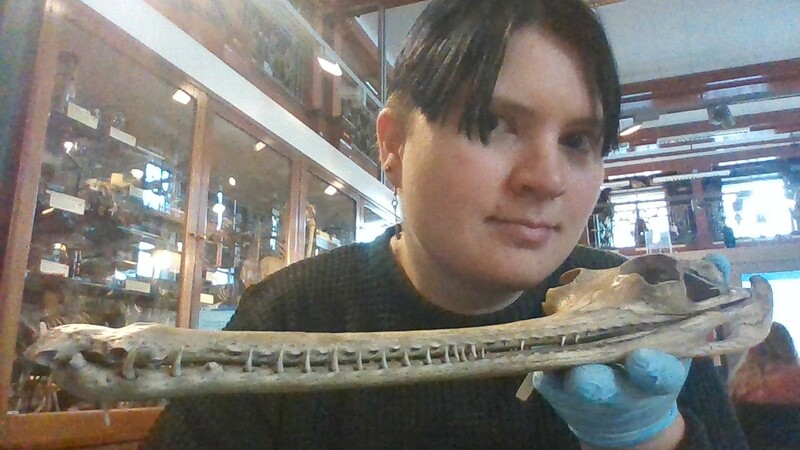 Back to London this week to meet our new curator, Dr Selina Groh, Research Associate in palaeontology at University College, London. Dr Groh studies ancient crocodiles, or crocodylomorphs, some of which free up to 7 ! For more, here’s his story. I’ve never really thought about doing anything else [other than science], from very early on – the natural world has always fascinated me in all its forms (when I was younger I wanted to become an astrophysicist, but that changed to zoology/palaeontology when I was a teenager). There is a hilarious video of two-year old me getting so fascinated by a bunch of rocks that I refuse to move. Vertebrate Palaeontology was a complete coincidence – I started off as ecologist in undergrad, then did an MA in evolutionary biology where one of my two MA projects was palaeontology (I was never really a vertebrate person – my BA thesis was on plant population dynamics and the two MA theses were on the taxonomy of harvestmen and morphological diversity of osteostracans (basal vertebrates), respectively). For my PhD I originally wanted to work with my favourite animals, spiders. But then I met my future PhD supervisor and after chatting about the project with him for a while I decided to take the dip into full on vertebrate palaeontology as the project sounded incredibly interesting and I really wanted to work with him as we got along really well. 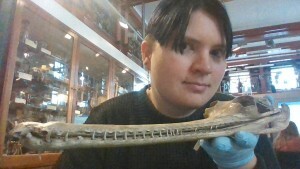 I work mainly on crocodile evolution! Crocodylomorphs (the name for the ancient group that contains all modern crocodiles, alligators & gharials) are a very old and diverse clade – there were over a thousand species compared to what we have today (23 species). We had terrestrial & marine crocs, herbivorous crocs, giant crocs, dwarf crocs, you name it. My work focuses on finding out how that diversity came about and how all these forms are related, spread across the earth, etc. In addition, I work in the more abstract field of phylogenetic methods, i.e. improving the methods that we use to find out how species are related. Why do this research? Because we need to understand and appreciate the past to care about the present. Crocodiles are quite an enigmatic species and thus really easy to get people interested in – and from there on it’s easier to educate them about nature, natural history, climate change etc. and even let them know a bit about the methodology we as scientists use. I do some public engagement & science comedy on the side – it was slightly dormant during the last phase of my PhD but I’m now trying to get back into it! I’m an ardent cosplayer and enjoy sewing and crafting in all its forms and being on stage performing. I also do HEMA (historical European Martial Arts) where I do longsword fighting.